Experience the ultimate in epicurean adventure with our new Zip ‘n Sip VIP package! It all begins with our epic zipline tour featuring six lines that soar over mountains, oaks, valleys and vineyards. Then, after your zipline tour, you will enjoy a guided “Legacy Tasting” with a personal wine educator at our affiliated Ancient Peaks Winery, which is located just across the street from our tour office. Here, you will savor limited-edition Pearl Collection bottlings and library selections from the winery’s estate Margarita Vineyard (whose vines you just zipped over!). These selections are paired with cheese and charcuterie, all inclusive. And if you want to bring a bottle home, you will enjoy exclusive 15% savings on wine purchases. The package costs just $135 on weekdays and $145 on weekends, providing exclusive bundled savings. You must be 21 and older. These tours are available starting at 9 a.m. on most tour days, beginning with your zipline tour, followed by your Legacy Tasting. 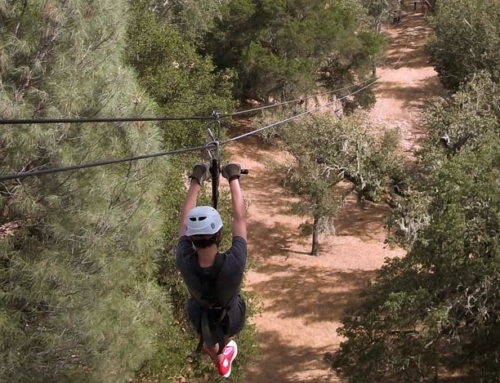 This is one of the “best things to do” in SLO County and the most unique California zipline tour experience. Click here to book your Zip ‘n Sip VIP adventure tour today.